1. Thoroughly whisk eggs and ½ the cheese with the milk. Salt and pepper to taste. 2. Oil cast iron pan on bottom and sides and wipe off excess with a paper towel. 3. Wilt spinach in covered pan with 1-2 T water for several minutes. Then add green onions and peppers over med-high heat until onions start to be clear. 4. Reduce temp to med-low; add egg mixture to pan and mix all ingredients as eggs cook on bottom and sides; about 10 minutes. 5. Add remaining cheese on top and place tomato halves, cut side up around top of dish. 6. Place the pan under a pre-heated broiler about 3 – 4 inches below element. Cook until eggs are cooked on top, cheese is melted and slightly brown and tomatoes are softening. Eggs, especially those raised from pasture raised hens, are an important part of our diet. We eat them as part of various cooked dishes, baked dishes; and we eat them scrambled, poached, fried, as omelets and frittatas and of course as Huevos Rancheros. This dish is eggs in the Frittata format; cooked in a skillet with cheese and vegetables and finished in the oven. 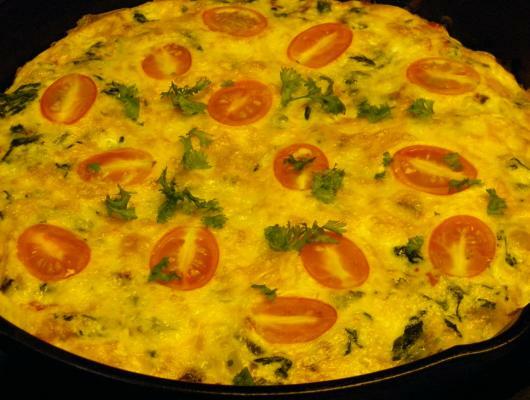 It is a delicious combination of baby spinach, tomatoes, peppers, eggs and cheese. It is flexible and can be eaten for breakfast, lunch or dinner with different side dishes. Here is a link to the video that shows how to prepare this frittata How To Cook a Tomato and Spinach Frittata on You Tube. 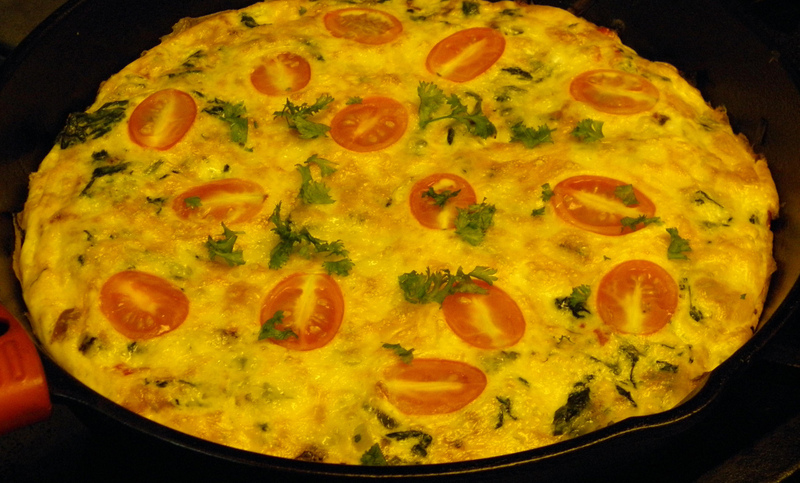 If you haven't yet tried a frittata, try this one; it is quick and easy to make and delicious.